Frontier Airlines is having another one day sale today with flights starting at $19 from Bloomington/Normal, IL; Chicago-O-Hare; Cincinnati, OH; Cleveland; Dallas/Ft. Worth; Denver, CO; Phoenix, St Louis; Trenton/Princeton; and Washington-Dulles for select dates this December. If you are interested in scoring any of these fares for $19, be sure to book sooner than later because during the past several sales that Frontier has offered, the fares usually sell out rather quickly. 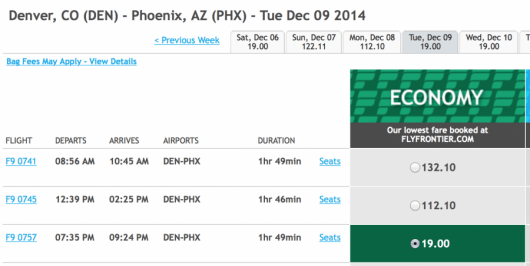 Tickets must be purchased by 11:59 pm Eastern time on Dec. 5, 2014 for domestic, nonstop travel on: Mondays, Tuesdays, Wednesdays, Thursdays, Fridays, Saturdays, Dec. 6, 2014 through Dec. 18, 2014. If you are looking for a quick getaway before the holidays, you might want to take a look at some of these deals.